The new Zalando Headquarters is designed as an ensemble of two new buildings that form the heart of the corporate campus in Berlin-Friedrichshain. 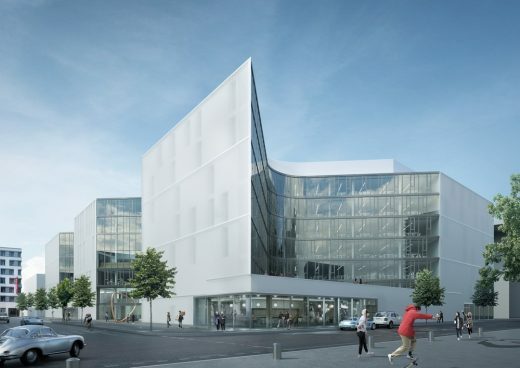 The project’s two seven-storey buildings provide some 42,000 m² of office space. 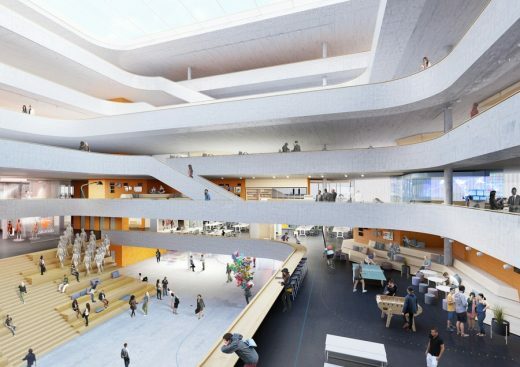 Up to 2,700 employees will work here for Europe’s largest online supplier of shoes and fashion goods. For the first time since its opening in 2000, the Autostadt in Wolfsburg received another building structure in the form of the new Porsche Pavilion. The organically shaped building is sitting at the central axis of the theme park and offers 400 m² of space for exhibitions and presentations. The Project House in the Research and Innovation Centre of the BMW Group in Munich opens up a new way of cooperation in the product development process because of the special way its space has been organised. Gläserne Manufaktur is a place of transparency and dialogue and makes the experience of automotive production visible to the outside. With its establishment in 1992 the Forschungszentrum Dresden – Rossendorf took over the task of developing a modern, internationally competitive research institution at this location. For this purpose steps had to be initiated to modernize buildings and infrastructure in order to run them on a commercially viable basis. The central idea behind the design is an encircling, crossed over and apparently never-ending band. Cast in concrete, it picks out the tectonics of the buildings as a central theme. Unity with various functional sections: as a leading company in the field of engine systems, MTU Aero Engines opens up a new production and development location in the Polish town of Rzeszów. The provision of 3,750 m² usable and ancillary floor area will provide the medical and scientific staff the necessary space to carry out their research and teaching activities and to develop new procedures and methods in the field of pre-clinical medicine. August 20, 2016 in Architects.